edited by Lucas Van Rompay, Sam Miglarese and David Morgan. University of North Carolina Press. (Chapel Hill, North Carolina, 2015). The Second Vatican Council dramatically changed the life, attitudes and thinking of the Catholic Church. Those who straddled the 1962-65 event quickly experienced how groundbreaking these were. Mass shifted from the Latin to the vernacular; relations with other Christians were marked by ecumenism rather than convert-making; dialogue with non-Christian religions was encouraged; collegiality, the co-responsibility of the world’s bishops with the pope in the church’s infallibility on faith and morals, was affirmed; the rights of all individuals, not just Catholics, to religious freedom was declared; greater lay participation in church life and decision making was encouraged and institutionalized; and anti-Semitism, especially the claim that the Jews of every era are responsible for Christ’s death, was rejected. These and other changes were not easily accepted and implemented in the post-Vatican II era. Vocations to the priesthood and religious life drastically declined as did Mass attendance, especially in the United States and Western Europe. Many priest left the priesthood. Some attributed this to the church going too far in its changes, while others said it didn’t go far enough as it maintained the ban on artificial birth control and left intact mandatory celibacy for Latin-rite priests. Even during the council, many bishops opposed the landmark changes inscribed in the council’s 16 documents. 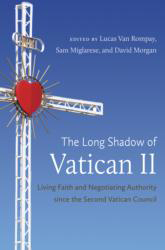 “The Long Shadow of Vatican II,” a collection of five essays by five different experts, examines the aftermath of the council and how its shadow still hovers over the church 50 years later. It centers almost exclusively on North America and Western Europe. The editors, all religious studies professors at Duke University, bookend the essays with an introduction and epilogue tying together the themes. One aim of the book is to show Catholics born after the council how dramatic and groundbreaking the changes were so they can better understand why the church looks like it does today and why so many of today’s Catholic controversies spring from the council. Another is to show how different ideological groups have tried to claim the council as their own to support their corner of Catholicism. This, several authors note, makes it necessary to understand what the council actually said so as to distinguish what is valid interpretation and what is self-serving misinterpretation. Perhaps the two most interesting essays for the post-Vatican II generation are on how the council was received in the United States and how it changed concepts of ecclesial authority. The most provocative is the essay on the controversy over women priests, written by Jill Peterfeso, religious studies professor at Guilford College in Greensboro, North Carolina. As an example of how some council interpretations have taken on their own life, she points out that some Catholic feminists interpret council texts on gender equality and greater lay participation in the life of the church as Vatican II support for a female priesthood although the council never treated this topic. Missing is a chapter on the council’s reception in the non-Western world, especially Africa and Asia. The book notes that, as opposed to North America and Western Europe, Catholicism has grown hugely in these two continents. But there is no elaboration as to whether this was a result of Vatican II or a series of other factors.